The Variable Mu and RMX16, in particular, offer the key sounds of classic hardware to your DAW. MS RMX16 reverb is straightforward to use but unique in sonic character. Manley Variable Mu is great for mix buss compression and provides 'mix glue'. Vertigo Sound processors both offer vintage character without unwanted noise. Since our last UAD review, two new versions of the company's system software have been released. Version 7.10 offered two new plug-ins, with recreations of the classic AMS RMX16 reverb and Summit Audio's TLA-100A compressor, developed alongside Softube. The AMS RMX16 was released in 1982, designed in Lancashire and provided the first full-bandwidth reverb unit controlled by microprocessor. Rather than employing fixed, 'mathematical-only' algorithms, the RMX16's blueprint was modified by ear to produce an uncommonly musical signal response. The resulting hardware became - and remains - an essential outboard processor for any self-respecting high-end recording studio but, for those of us on tighter budgets, UAD's plug-in represents good news. "So what makes the RMX16 so special? In short, its versatility,"
Compared to many reverbs, the RMX16 is extremely simple to use. Firstly, click on the right-hand side of the red LCD-style display to select an algorithm from Ambience, Room A1, Hall C1, Plate A1, Hall B3, Chorus 1, Echo, NonLin 2 and Reverse 1. Then, the buttons below the display, controlling individual parameters, are largely self-explanatory. All of the original preset programs are available, which you can select by clicking the program button, before selecting a preset number manually, or by pressing the Nudge Up/Down buttons which incrementally add or reduce the currently selected parameter in single units. PreDelay, Decay Time and Decay Filter (controlling high and low frequency Decay Times independently) buttons can be edited similarly, whilst you can decide upon a Dry/Wet balance for insert treatments, or select a Wet Solo option for Auxiliary effects. For parameters which operate over a wider range, the Pot dial to the left allows you to dial in larger numbers, whilst Input and Output levels can be tweaked on the far left-hand side. So what makes the RMX16 so special? In short, its versatility, the classic nature of its assorted algorithms and its extremely musical sound. This is best demonstrated by its most famous algorithm - NonLin - which was responsible for that Phil Collins drum sound used in In The Air Tonight. It's an algorithm which mimics a gated drum signal without you having to produce the gating yourself, which sums up the spirit and independent thinking behind this unit. For us, however, the Ambience algorithm is the embodiment of reverb heaven on top-end sounds, offering a sparkle, shimmer and sheen which works beautifully on vocals, strings, pads, leads or anything else to which you want to bring a celestial quality. But there isn't a single algorithm here which won't do something useful to your mix, whether you want some classic '80s chorus, the warm richness of the Halls, the vocal wonder of the Plate, and so on. 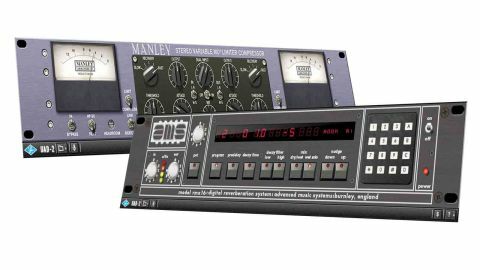 UAD's 7.11 release contained a plug-in model for which there has been much clamour: a thorough and detailed recreation of Manley's Variable Mu compressor. Whilst UAD's recreation of the Massive Passive has proved hugely popular, we've been kept waiting for a modelled version of Manley's flagship compressor. "Very few processors provide the sonic character of the Variable Mu"
The hardware, from which UAD's plug-in is cloned, is made by hand and is tube and transformer-driven. It's equally popular with mastering and mix engineers and has developed a reputation as a tool which glues audio together, at the same time as adding what you'd expect of a compressor: power, punch and dynamics control. When linked, the Variable Mu works in stereo, with controls tweaked on either side of the centre automatically assigning the same settings to the other side. Once you've selected the compression Threshold level, you can tweak Recovery (Release) Time across five notched positions from Fast to Slow, whilst Attack Time is adjusted via a more regular dial control. Parallel Compression treatments are made easy via a Mix control to blend uncompressed signals with processed ones, whilst there's also an extremely useful filter control which allows you to omit frequencies below 100Hz from the processing chain, leaving the bottom-end untouched. This is particularly useful if you're planning to process drum overheads from which you want to 'miss out' bass drum spill. Buss compression, either applied to grouped sounds within a mix (like drums or guitar stacks, for instance), or strapped across the output chain to dynamically process an entire mix, is common practice. But very few processors provide the sonic character of the Variable Mu. It has become famous for giving the sounds it processes 'a warm hug' and, whilst that might be too queasy a phrase for most readers, it's an apt description. It warms sounds up, ties them together and provides a level of mix continuity you might not have even known you were missing. UAD's clones of both this and the AMS RMX16 are thoroughly recommended. Which brings us to two places called Vertigo. Vertigo Sound was established in 2007 with the remit of building outboard hardware which emulated the tonal character of classic gear but allied this to the low-noise and high headroom specifications of contemporary equipment. That became the company's mission statement and its first offering, now cloned by Brainworx for UAD, is the VSC-2 VCA compressor. The feature set here provides a rotary Threshold control before stepped dials for Ratio (with Soft, 2:1, 4:1, 8:1, 10:1 and Brick(wall) options), Attack and Release. Make-up Gain can be added up to 22dB, whilst the unit can be used either in mono, stereo or dual mono mode. "The VSM-3 has found itself proving hugely popular with mastering engineers looking to bring colour, bite and grit to lifeless mixes"
The VSC-2's character comes from the internal structure, which provides two VCAs per channel (four in total). The first comes in the main audio path, whilst the second is inside each channel's side-chain. The VCAs work together to determine independent compression settings for both channels, as they aren't summed to unify the stereo 'image'. In practice, this means a versatile, vintage-sounding compressor which adds plenty of character without injecting the high noise values you might immediately associate with the hardware of yesteryear. The second of the Vertigo Sound clones is the VSM-3, which allows you to add colouration and saturation to masters, whole mixes, or components thereof. Processing comes in two main stages - the 2nd Harmonic FET Crusher, and then the 3rd Harmonic Zener Blender. Both modules provide Drive, Level, Filter Shape and Mix controls but part of the joy here is that both processing and monitoring are super-flexible. Mid, Side or stereo sonic enhancement is available to both 2nd and 3rd Harmonic processors, as well as separate Harmonic monitoring, allowing you to hear exactly what you're adding to the input signal. Whereas distortion isn't an effect you'd most commonly associate with mastering, the VSM-3 has found itself proving hugely popular with mastering engineers looking to bring colour, bite and grit to lifeless mixes. However, as a 'rougher up' of synth leads, drum loops, basslines and other mix elements, it has a huge amount to offer, especially bearing in mind it's a processor which allows for much more subtle flavours of distortion than most other units which offer that effect.